I was curious about Leon County land sales, or more specifically, how the large parcel sales were doing around Tallahassee. If you are a long-time reader of the Tallahassee Real Estate Blog, then you are certainly aware of the fact that Tallahassee was over-built and over-developed during the boom of the housing market. 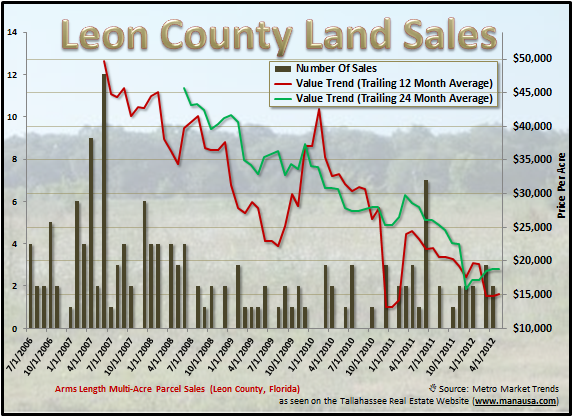 This means that Leon County land sales have fallen greatly over the past six years, and the need for newly developed lots is many years away. This lack of demand has driven values low enough that we have begun seeing investors move in to the Tallahassee real estate market to claim some larger parcels with the plan of holding for several years then developing during our next phase of growth in Tallahassee. The real estate graph above was prepared by looking at all of the large Leon County Land Sales that were either still sub-dividable or represented a package of subdivided lots. Additionally, I removed all sales that showed evidence of bank involvement. The volume of land sales appears to have stabilized at a moderately slow rate over the past three years, and values continue crawling lower. At this point, cash paying investors can hand select some value choices and stand to own a very safe 10 to 15 year investment. This means that large net-worth investors and small institutional investors will find some wonderful opportunities to park their money for a few years. Land that would have (and will again) sell for several hundred thousand dollars per acre can be found now for less than $20,000 per acre. If you want to know more about investing in long-term land holdings in the best areas of the Tallahassee real estate market, simply drop me a note and we can schedule a time to create a strategy that will give you the returns and the safety that you seek with your investment dollars. I hope you enjoyed our report, please check back again for updates on Leon County land sales.